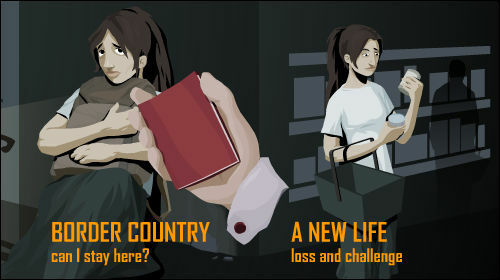 Against All Odds is a Flash game created as an attempt to educate players about refugees in general, and also indirectly provide information on the work that UNHCR does. There are twelve scenes in total, with each act consisting of a small game, but no reward is offered when all three chapters are completed. More than half of these consists of multiple choice questions or trial and error situations, where players have to guess answers to a series of questions correctly to proceed. The third act can be a little tricky to solve, because escape is only possible once you've found the man indicated by a green dot, hiding in one of the alleys near the heavily guarded exit.